This short story is based on the fan fiction challenge on page 210 of the novel and writing guide, Polly Wants to Be a Writer. I lived in England. The year was 1642. The cold January day made me shiver in my thin cloak and dress. It was after dinner, and I had to go to the market with the few coins I had made from sweeping shops and delivering packages. I was perusing the stalls when an old woman walked over to me. She beckoned, and I was curious. I followed. We reached the small shop within a minute or two. It was a very small place, full of trinkets and useless items. It was the kind of place where my younger brothers loved to go. “D—Doritha, but you—you can call me D—Dory, ma’am,” I stuttered while bowing into a shaky curtsy. This woman unsettled me in a strange way that I couldn’t explain. “Oh, but you don’t have to buy it. ‘Tis a gift from my humble heart,” the woman smiled widely, showing her yellowed teeth. She handed me the box. It was quite a beautiful case, with a silver lining around it and a golden clasp. I tried to flick the clasp up with my finger, but it did not budge. That was when I noticed the small lock. “Thank you!” I grinned. I could sell this for a pretty price. I waved my hand slightly and then glided out of the shop. I was very excited. This could feed my family for several months. I decided I would go to the forest outside the village for a while. It was right by our house, and I had till the clock struck eight to be back home. It was half past seven. I sat down on the cold ground with a shiver and pulled the box out of the big pocket on the apron I was wearing over my dress. Once I had that balanced in my lap, I pulled out the key. I fit it into the tiny lock and turned it. A small click emanated from the lock, and the lid popped partially open. I lifted the lid to see a soft lining of velvet. In the middle of the small chest lay a silver bullet. I gasped. This was more valuable than I had ever dreamed of. My father had always said that he wished he had one, and he knew they were prized among many. Silver bullets were rare. I reached out my shaking fingers to touch my prize. My hands grasped around it, and it shone in the moonlight. All of a sudden, a shock ran through my body. I tried to drop the bullet, but my hand was locked around it. The circulation was being cut off from my fingers because I was grasping it so tight. I felt sharp shards of pain pierce through my body. Then it stopped. The bullet dropped out of my fingers, and everything went black. When I woke up, the clock was sounding. It was eight. I needed to go back home. I slowly remembered what had happened. The bullet! I looked around frantically, but it was gone. The box was gone as well. I must have dreamt the whole thing up! Or had I? I wasn’t sure. I rubbed my head thinking I had dreamed it all up. I slowly got up and turned to home, only to see a patrol of soldiers walking towards me. I curtsied and looked up at them as they stopped. “How can I help you?” I asked. A horrified look crossed their faces. “What is—what is wrong?” I said fearfully. “Get her!” the leader called. They started to chase me. I ran off towards the marketplace with the fear of death in my heart. The soldiers were gaining on me. I didn’t know what was going on. What was wrong with me? I stopped by an empty market stall where a small mirror was sitting. I gasped at my horrific appearance. My eyes were tinted red, and my pupils were shrunken to tiny dots. My dark hair was wilder than it had been before, and my fingernails were taking strange shapes. They looked like claws. The most shocking thing about it was my teeth. Two sharp white fangs protruded from my gums, glistening in the starlight. I was a monster. I was a monster, and there was no arguing that. I was about to face the soldiers and head to my doom when a hand grabbed mine. I followed the hand, which was connected to a body. The body was covered in a dark cloak. Finally, we reached a blank brick wall. I was about to run away from the figure. It could be anyone. A thief or an escaped convict, maybe. The figure pulled the hood off of its head, revealing dark brown hair. He was a boy. He wasn’t bothered by my monstrous appearance. I was about to scream for help, but there was something about him that interested me. But then I remembered. I couldn’t scream for help because the soldiers would kill me on sight. I watched as he crouched close to the wall, moving his fingers across it. Something clicked, and the red bricks slid aside to reveal a dark hole. He turned his face to me, and I gasped. Bright fangs glistened in his mouth, and his eyes were tinted silver. 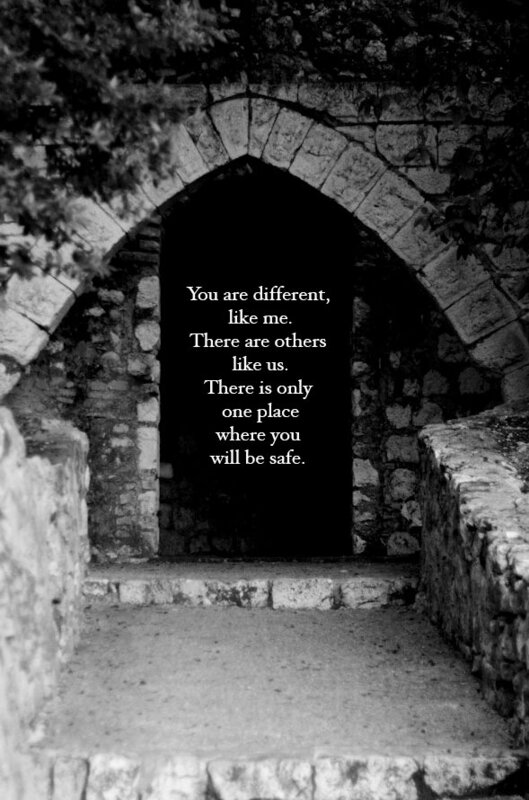 “You are different like me. There are others like us. There is only one place where you will be safe,” he said, eyes piercing through the night. “Wh—where is that?” I stuttered. Without giving me time to reflect on what he had said, he grabbed my hand and pulled me into the darkness.